The new musical adaptation of Mean Girls will begin previews at Broadway's August Wilson Theatre on March 12, 2018! The show will open on April 8. The musical with a book adapted by the film's screenwriter, Tina Fey, will include an original score by Jeff Richmond (music) and Nell Benjamin (lyrics). It will be directed and choreographed by Casey Nicholaw (The Book of Mormon, Aladdin). As previously announced, the new stage-musical adaptation will play out of town at Washington, D.C.’s National Theatre. The D.C. engagement will run from October 31 through December 3. 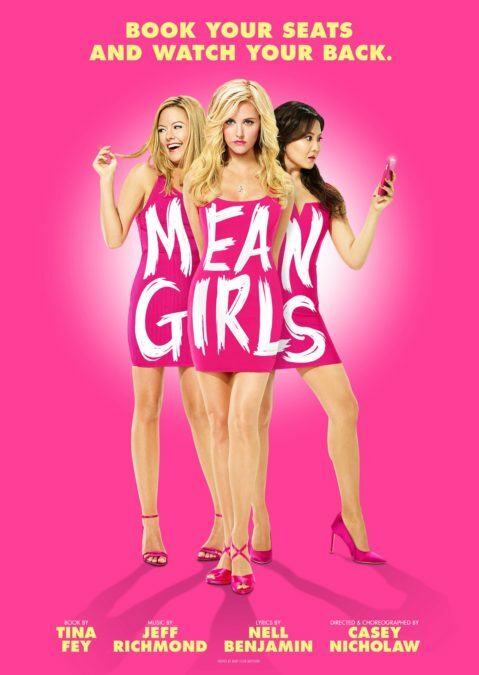 Mean Girls will star Erika Henningsen as Cady Heron, Taylor Louderman as Regina George, Ashley Park as Gretchen Wieners, Kate Rockwell as Karen Smith, Barrett Wilbert Weed as Janis Sarkisian, Grey Henson as Damian Hubbard, Kerry Butler as Ms. Norbury, Kyle Selig as Aaron Samuels, Cheech Manohar as Kevin Gnapoor and Rick Younger as Mr. Duvall. After years of living with her zoologist parents in Africa, Cady Heron (Henningsen) moves to Illinois and must find where she fits in the social hierarchy. A sweet, naive newbie, Cady quickly attracts the attention of The Plastics, a trio of popular frenemies led by the vicious and calculating Regina George (Louderman). When Cady devises a plan to end Regina’s reign, she learns that you can’t cross a Queen Bee without getting stung. The cast of Mean Girls will also include Stephanie Lynn Bissonnette, Tee Boyich, Collins Conley, Ben Cook, DeMarius Copes, Kevin Csolak, Devon Hadsell, Curtis Edwin Holland, Myles McHale, Chris Medlin, Brittany Nicholas, Becca Petersen, Nikhil Saboo, Jonalyn Saxer, Brendon Stimson, Riza Takahashi, Kamille Upshaw, Zurin Villanueva, Gianna Yanelli and Iain Young. The Mean Girls creative team includes Scott Pask (set design), Gregg Barnes (costume design), Kenneth Posner (lighting design), Brian Ronan (sound design) and Finn Ross & Adam Young (video design). The August Wilson Theatre is the current home of Groundhog Day, which is slated to conclude its run on September 17.